One of my mother’s clients was a director of Fleetway Publications, which was part of the Mirror Group. Her name was Peggy Sutherland. She arranged with Puffin and other publishing houses to send me books and comics on a regular basis. The Little White Horse turned up one day when I was about eight and a half. I opened it eagerly because the cover was enchanting. But a word on the first page tripped me up in that moment and I put it back on my bookshelf. One afternoon, about six months later, when I was looking for something to read, I picked up the book again and this time I didn’t put it down. 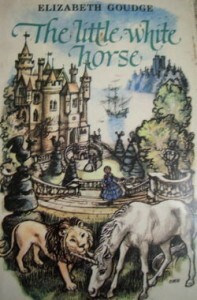 The Little White Horse became my favourite childhood book and remains a favourite today. When I began reading Harry Potter, I was reminded of my childhood favourite, and discovered it was Rowling’s favourite book as a child. Anyone who knows this book will immediately see its influence on Rowling’s fantastical story.